Los Angeles, USA. For immediate release. LA based producer Alex Garcia joins London based producer Paula Vaccaro and Executive Producer Jim Jarmusch on upcoming feature documentary Uncle Howard. 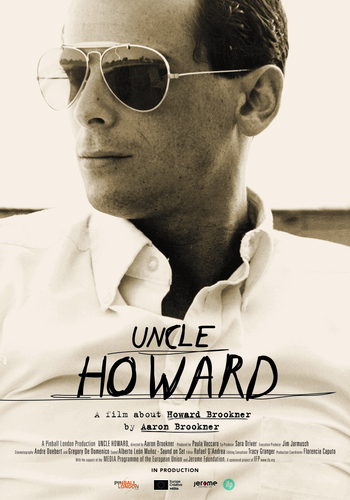 The film, currently in post production in London, UK, tells the story of filmmaker Howard Brookner, who died of AIDS in New York City in 1989. Directed by Aaron Brookner, Howard's nephew, the film features Jim Jarmusch, Robert Wilson, William S. Burroughs, France's ex-Culture Minister Frédéric Mitterrand and never before seen outtakes of Burroughs: The Movie, Nova Convention, as well as behind the scenes of Howard Brookner's last film Bloodhounds of Broadway starring Madonna, Matt Dillon and Jennifer Grey as never seen archival footage. Award winning production company. We work with Emir Kusturica, Sally Potter & other auteurs. @UncleHowardFilm about @HowardBrookner coming soon.